After forty three years of filming birds this week I was able to film only my seventh pair of Green Woodpeckers with young. It was in fact twenty five years before I found a suitable nest site for filming so it is always a privilege to spend time with these beautiful birds. The main food source for the young are the eggs of ants. It takes some time to find these so feeds are at thirty to forty minute intervals. However, because the adults carry them in their crop when they feed their young they are at the hole for more than a minute on each visit. 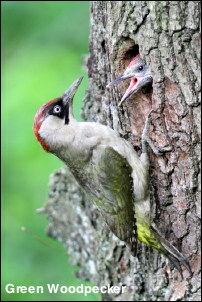 Click here to see more photos of the Green Woodpecker including one with ant eggs visible on its bill. The male Green Woodpecker is the one with the crimson moustache. During the week I went in search of a Sparrowhawk that was reported as breeding along the Rochdale canal I failed to find the Sparrowhawk but did see a Kingfisher which is unusual at the height of the breeding season. Was this Kingfisher breeding in a bank nearby? In the garden we now have fledged Goldfinches, Robins and Redpolls. It is only the Reed Buntings and Bullfinches that have yet to bring their young to feed. A Willow Warbler was a welcome addition one day as it searched for aphids in the fresh greenery. Since returning from Islay all week has been spent checking nest sites and searching for new nests. 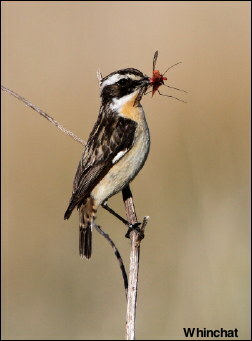 It has become apparent that the Whinchat has now disappeared from many of its Pennine haunts for no obvious reason. In fact I have not seen a local Whinchat all season. This weeks photo and gallery album (click here) were all taken on Islay last week where the Whinchat is still quite common. 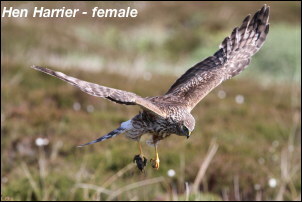 What is also apparent this year is that many of the Pennine raptors have not bred or have failed in the early stages of breeding. At present I have no occupied Barn Owl or Kestrel sites and my one breeding pair of Long Eared Owls failed while I was on Islay. The others not even attempting to breed. I suspect last years wet weather coupled with this years cold Spring left the birds in poor breeding condition. On the plus side the Kingfisher succeeded in fledging its first brood of young and I now have my first ever local breeding pair of Buzzards, which now have small young. A pair of Linnets have taken advantage of the planting of gorse on Hopwood by building their nest. Let’s hope that these will be followed by the return of Partridges. On the down side there are no breeding Sand Martins or Green Woodpeckers this year. Our third week on Islay and no visit to the Hebrides is complete without filming some of its seabirds. During the week I checked out some of the regular sites for Fulmars knowing those amongst the Sea Thrift would look even better this year in view of the lateness of the flowers. 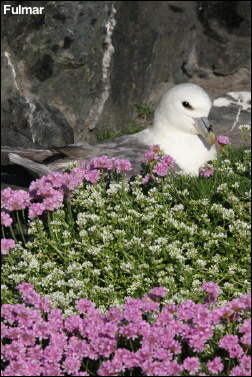 I was not disappointed and some incubating birds looked stunning surrounded by the pink thrift. A tern colony produced good numbers of both Arctic and Little Terns but as usual disturbance from wandering sheep was critical. Nearby was a post breeding flock of more than two hundred drake Eider ducks, at least a hundred of which are shown in this week’s gallery. Black Guillemots are not common birds on Islay but one morning I spent a couple of hours by a distillery pier filming half a dozen as they interacted on the sea. In a wet meadow nearby Snipe were finding some good feeding in the damp conditions. Three weeks on Islay and only one day of rain with plenty of sunshine prevailing. One of Scotland’s rarest butterflies is the Marsh Fritillery and the warm conditions and sun produced a good emergence of this butterfly making this year a good one for them. In the last seven days Islay has been the sunniest place in Britain on two days and we have had well over one hundred hours of sunshine. During this visit I have been concentrating on Hen Harriers and having spent seventeen hours in my hide, with temperatures of up to 23°C it has been somewhat hot! This week’s gallery shows a warm misty dawn and some of the other Islay birds that we have encountered in our daily wildlife watching. These include Hooded Crow, Twite, Buzzard, Oyster Catcher and three Chough that flew over my head whilst I was watching the Harriers. One night we watched an Otter fishing but not close enough to photograph. We estimate the plant life on Islay now two – three weeks later than normal. How great it is to be back on Islay which is still catching up on a late Spring. The bluebell woods are better than ever with outstanding carpets of bluebells and primroses. Normally we would be too late for this display but this time the timing of our visit is perfect. As you travel around Islay there are amazing numbers of small birds all searching for food for their young. 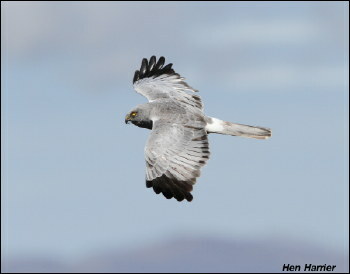 Stonechats,Whinchats, Whitethroats,Skylarks and Pipits are everywhere and the air is full of birdsong.These small birds are the reason for the Hen Harriers and today’s photo shows a hunting male, one of the star attractions to Islay in Summer. Two visits to the shore in search of Otters met with 50% success. A dog Otter was watched and filmed but unfortunately he never came nearer than fifty feet away. Even at that distance you could clearly hear the crunching of the crabs as he devoured his catch. Dandelions are one of our most commonest flowers and one of the first to go to seed in Spring. On Islay these seeds have been devoured by Siskins, Linnets and Redpolls and I have had several good sessions filming these birds from the car.I even managed to take a photo of the male Linnet feeding the female as part of his courtship. Click here to see some of this week’s photos.